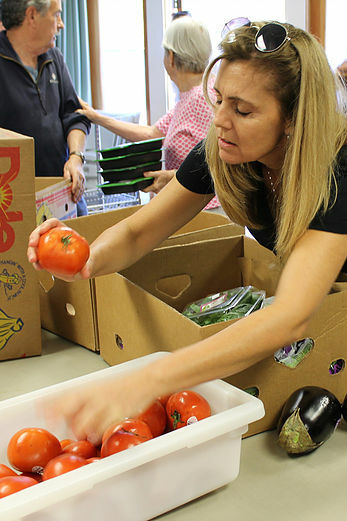 Laguna Food Pantry offers food to people in need. There is no fee to shop. All food is free. You may shop with us once a week. You do not need to be a resident of Laguna Beach. Shoppers do not need to show proof of income or citizenship status. We ask shoppers to sign in so that we can keep track of patronage. You may choose what you need based on the number of people in your household. Numbers on shelves show how many a shopper may take. Food items are fresh and almost always in their original packaging, displayed the way you would find at a supermarket. We can connect you with representatives from CalFresh, the public benefits program formerly known as Food Stamps. CalFresh EBT cards can be used at most grocery stores, discount chains, farmers’ markets and neighborhood stores to buy fresh fruits and vegetables, whole grains, lean proteins and more. If you are 60 or older, disabled, or homeless, you may be eligible to purchase prepared meals at certified restaurants in some counties. We are located 0.7 miles south of the intersection of El Toro Road and Laguna Canyon Road, between the Dog Park and the Pacific Marine Mammal Center.